Peace on Earth - Roberts Architects LTD Roberts Construction Group, Inc. This years holiday sketch is in memory of Norman Raedle, my father in law, friend, and mentor. Norm was special person in my life. Alway's positive and friendly, sincerely interested in what I was doing, always available to listen, and never judgmental. He was an example to me of how to be a father and a friend. He balanced a successful career while being a true family man of humble beginnings that gave back to his Evanston community in so many ways throughout his life. He loved to visit our construction sites with me, we would take tours around town as I showed him the homes we had designed and were building. It always turned into a history lesson for me as he shared his experiences of growing up and raising his family in Evanston. 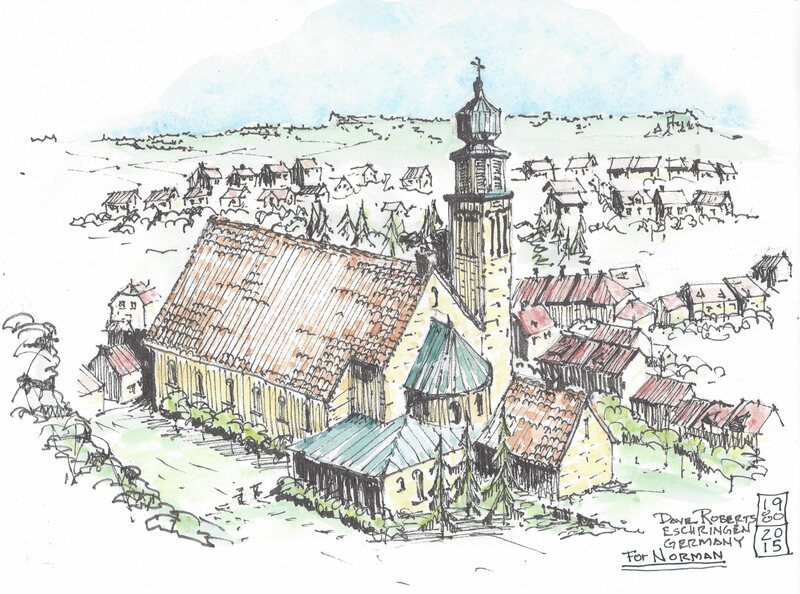 I originally made this sketch of Eschringen Germany (His Mother's hometown) while sitting on the hillside above the town where he spent time in his childhood. The original sketch hangs on the wall of my in laws home. Lissa and I visited Germany and Eschringen with Norm and Sally in 1980 during his first return to Germany since the 1930's. It was a special first reunion of many with his German family.